NEW Escape Room Themes + Kids Escape Room Too! 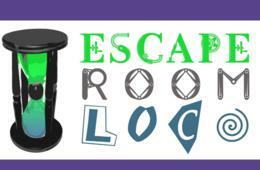 At Escape Room LoCo in Leesburg VA, the goal is simple yet challenging: TO ESCAPE FROM THE ROOM IN 60 MINUTES OR LESS! This adventure will challenge your mind and get your adrenaline pumping as you race the clock. Solve riddles and puzzles in the hopes of unlocking the door and earning your freedom. You can only win if you work as a team! Worried about getting stuck and never getting out? No need to worry! Staff members will be standing by to dole out clues, if you'd like. Or, for those who like to leave such things to the fates, a wheel-spin before the game can determine how many clues you're allowed. Mission to Mars: KIDS Room Escape! Designed for families with children aged 7-15, this room allows young adventure-seekers to feel the rush of adrenaline while solving the puzzles and facing a challenge: Survive on Mars and launch the rocket in just 45 minutes! NEW! Loco Airlines - Designed for adults, you are on an airliner heading towards your destination when disaster strikes - Do whatever you can to get home safely! This is the hardest escape room. You'll start out locked into the seat of an airline cabin. You'll have to work your way towards the cockpit to land the plane in 60 minutes. Expect lots of technology and a real challenge. NOTE: Kids clues are not available for this room. One adult must be in the room. NEW! Aslyum - Designed for adults, half of your group goes into the doctors office; half of you are patients in straight jackets. Work together to escape in 60 minutes - before the patients go crazy! NOTE: Kids clues are not available for this room. One adult must be in the room. Great for team-building, entertaining out-of-town guests and a fun family or grown-up night out! $95 for 45-Minute Mission to Mars: Kids Escape Room Game for Up to Six People ($174 Value - 46% Off). $79 for 60-Minute Escape Room Game for Four People ($116 Value - 32% Off). $105 for 60-Minute Private Escape Room Game for up to Six People ($174 Value - 40% Off). Thursday: 2:30 p.m. - 10 p.m.
Friday: 1:30 p.m. - 10 p.m. NOTE: You can upgrade to (8) eight people for an additional fee of $20 per person, paid directly to the vendor. Enter your 9-digit Vendor Code in the "Have a promotion/coupon code?" box on the top left of the screen. Select Difficulty Level and then complete booking. Present your CertifiKID voucher (printed or on a smartphone) upon arrival. Questions? Need More Information? Please contact Escape Room Loco at 703-468-8538. Valid only at Escape Room Loco. Entire voucher must be used in one visit. Cannot be combined with any other special offers, promotions or discounts. Not valid on prior purchases or reservations. Vendor is responsible for the quality of the products or services provided at redemption. Operating hours are subject to change; check directly with vendor prior to visit.